Much of contemporary medical theory and practice focuses on the identification of specific causes of disease. However, this has not always been the case: until the early nineteenth century physicians thought of diseases in quite different terms. The modern quest for causes of disease can be seen as a single Lakatosian research programme. One can track the rise and elaboration of this programme by a series of case histories. The success of work on bacterial diseases such as cholera and tuberculosis tends to eclipse the broad context in which those studies were embedded. Yet, in the 1830s, fifty years before Koch's publications on tuberculosis, specific causes were already being identified for several non-bacterial diseases including scabies, muscardine and ringworm. Moreover, by the end of the century, the quest for specific causes had spread well beyond bacterial diseases. The expanding research programme included Freud's early work on psychopathology, the discovery of viruses, the discovery of vitamins, and the recognition of genetic disorders such as Down's syndrome. Existing historical discussions of research in these areas, for example, histories of work on the deficiencies diseases, take the view that success in bacteriology was a positive obstacle to the identification of causes for other kinds of diseases. Treating the quest for causes as a single coherent research programme provides a better understanding of the disease concepts that characterise the last 150 years of medical thought. 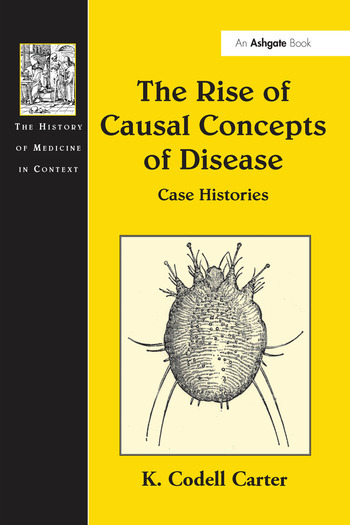 Contents: Preface; Introduction; Causes of disease in early 19th-century practical medicine; Universal necessary causes; Etiological characterizations; Microorganisms as causes; The bacterial hyphothesis; A bacterial theory of disease; Proving disease causation; The etiological standpoint; An ideational theory of disease; Protozoal and viral theories of disease; A nutritional deficiency theory of disease; Some final thoughts; Bibliography; Index.